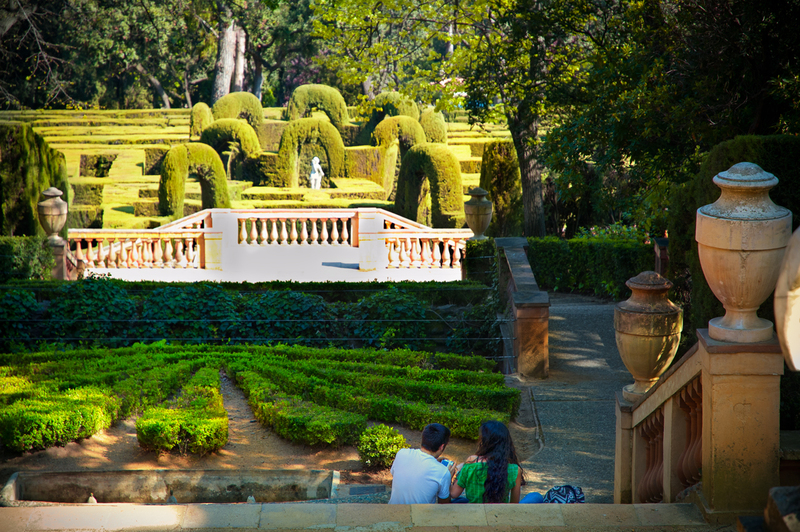 Horta Labyrinth Park in Barcelona or Parc del Laberint d'Horta as it is known in Catalan is one of those places you should not miss and yet generally overlooked due to its location in the upper limits of the city near Collserola mountains. This combination of neoclassical and romantic garden has been featured in Barcelona Photoblog before: Parc del Laberint, the Romantic Maze at Horta District so I am not going to talk about history. This time I want to remind you that Saint Valentine is just a week away and what better than a Romantic garden and the privacy of a young couple to welcome such beautiful celebration. Have you made up your mind on your St. Valentine gifts? Wow, Carlos, this looks fabulous. It's now on the list for our next visit to Barcelona. I think it's one of the most amazing parks in Barcelona with a breath-taking atmosphere. It's romantic, very old and definitely has some kind of magic! Nice composition. We should try to count the different shades of green in this picture. The different details in this photo tell a story! Including the couple in the shot was a nice touch. It adds to the romantic theme of the photo. This would look good on a postcard! thats the park with the maze? If so then we walked all over the place once looking for it and after getting off at the wrong metro station and walking across a motorway etc.. finally found it and wow did we enjoy it..